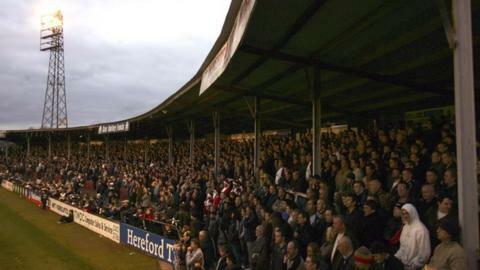 Hereford United have averted the threat of closure by completing their latest overdue tax payment. The Conference Premier club were short of their £78,000 target at Monday's High Court hearing in London to answer a winding-up petition brought by Revenue and Customs (HMRC). But Bulls chairman David Keyte has now revealed that the club actually made an interim £40,000 payment last Friday. "I managed to negotiate an agreement with the HMRC," said Keyte. "That allowed us to pay off £40,000 on Friday last and then fellow director Dave Preedy attended court on Monday to seek an adjournment in order to give us time to raise the second instalment of a similar amount. "This morning's payment has been a combined effort which is how we can make this work." Comedian and Chelsea fan Omid Djalili staged two shows in Hereford on Sunday to raise money, brewing company Heineken, who own Hereford cider-makers Bulmer, gave £10,000 and Bulls FA Cup legend Ricky George donated his £1,500 Grand National winnings from betting on Pineau De Re last Saturday. Online donations and the purchase of shares and pitch squares have also helped raise a further £10,000. The Bulls, who have been struggling financially ever since being relegated from the Football League in May 2012, avoided a winding-up order in January over the non-payment of their £36,800 PAYE bill for November and December. Hereford United's average attendances have halved in five seasons on their way down from League One to the Conference Premier. Hereford have attracted average home crowds of just 1,723 this season - half of what they pulled in at Edgar Street five years ago - and are still losing money by the week. Needing home crowds of 2,000 to break even, Bulls fans responded at last week's home game with Grimsby Town, swelling the gate to 2,545 - but that dropped to 2,140 on Saturday for the visit of Woking. Spirits have been raised, however, by Tuesday's 1-0 win at Welling United - the Bulls' first in 14 games and their first three points under new boss Peter Beadle. Dressing room morale had been affected by the club's continued off-field struggles, which has meant salaries, both in and out of the dressing room, not being paid in full on more than one occasion. But Keyte said: "The players have my word that their money will be paid even if the cash flow suggests it will be staged and late. "I have also continued to speak to a group of potential investors who wish to talk further."